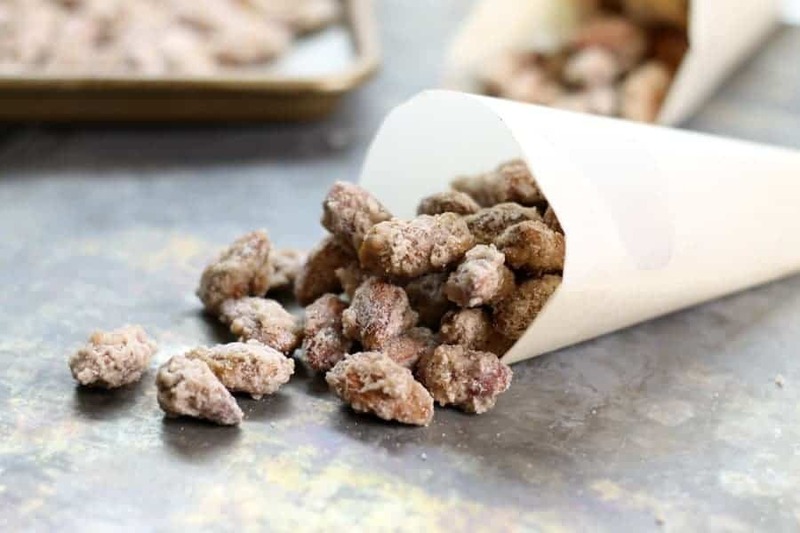 Candied almonds, or gebrannte mandeln as they are called in Germany, are a traditional treat most often sold during the Christmas season at Christmas markets and fairs. That doesn’t mean they are only a Christmas treat though! Growing up in Canada, I was fortunate enough to be able to visit my family a few times during the Holiday season, and I always loved going to these Christmas markets ( or Weihnachtsmarkt) with my grandparents and enjoying all kinds of delicious foods. What I remember most of all are these these sweet, perfectly roasted, candied almonds! There’s always so much to see and do at the Christmas markets. There are countless food vendors, craftsmen with handmade goods/gifts, live entertainment, and of course the hustle and bustle of people doing their Christmas shopping and enjoying the holidays with friends and family. Fortunately our little town of Charlottetown in PEI has started holding a Victorian inspired Christmas market every year! Yay! So I get to enjoy a little bit of my childhood without having to travel so far! The food was what always stood out to me with so much delicious food to choose from it would be hard to make up my mind and decide what I wanted to spend my allotted money on. Would I get a crepe with various sweet toppings? A grilled sausage on a bun with mustard and sauerkraut? Or some fresh “pommes” ( french fries). Regardless of what I chose to spend my money on, I always made sure I had just enough left over to pick up two bags of the candied almonds. One to eat right away, and one to (hopefully!) bring back to Canada with me. There is just something so addicting about these sweet nuts, once you start you can’t stop eating them! Since I didn’t find any at our local Christmas Market I was determined to figure out how to make those candied almonds I remember so well myself. Fortunately it is surprisingly easy to make ‘gebrannte mandeln’ at home and you only need a handful of ingredients! 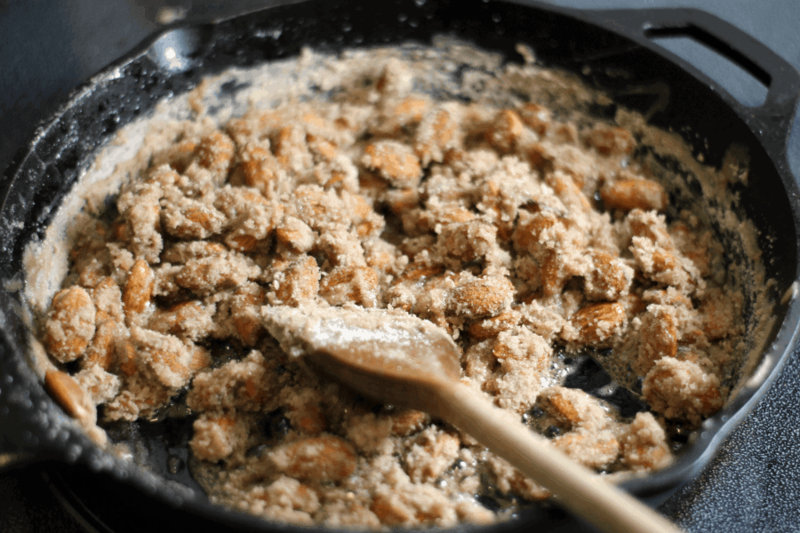 Before we dive into me showing you how to make these delicious crunchy nuts at home, I do want to caution you that working with hot sugar( as this recipe calls for) can be extremely dangerous. That doesn’t mean you shouldn’t attempt this yourself. If you have never worked with hot sugar before it is important to understand that by caramelizing sugar, it reaches a temperature in excess of 200F. That’s really really HOT! Sugar bubbles as it cooks and can cause severe burns, which is why this recipe should be made by adults (kids can watch!). Sugar can also burn very quickly and as such a deep heavy bottomed pot or cast iron pot should be used to candy these almonds at home. Cast iron evenly distributes the heat reducing the chance your sugar will burn on one side of the pan! The deep sides also help prevent any bubbling over or splatter. 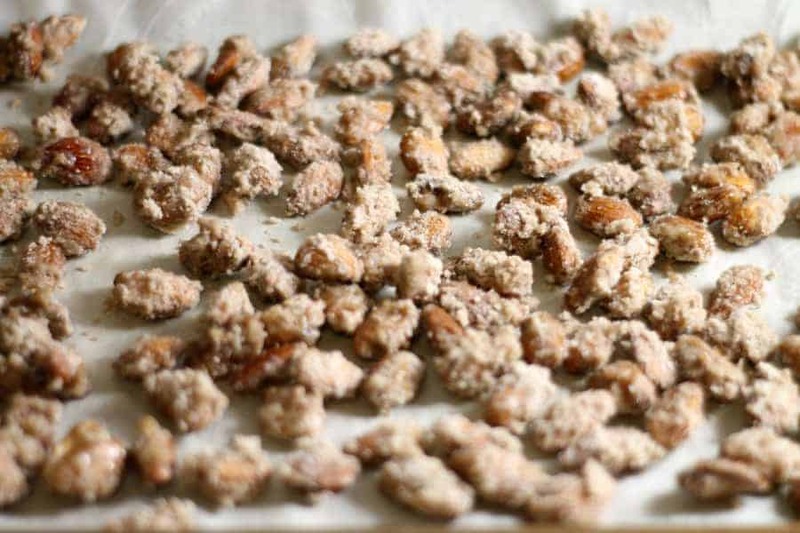 Before you start making your candied almonds, make sure to line a sheet pan or cookie sheet with parchment paper. This will be used to cool the hot nuts once cooked! Add the water and regular white sugar to the pan and bring it to a boil. As soon as the sugar water starts to boil, turn down the heat to a medium temperature. The water will eventually simply evaporate, but it helps ensure that all the sugar melts evenly and does not start to caramelize to early. If you keep the temperature to high, you run the risk of burning the sugar before it can properly cook, and caramelize. As soon as the sugar mixture is boiling add the raw almonds. Again be careful not to burn yourself on the hot sugar, or the steam coming of the pan! It’s best to use raw almonds instead of roasted ones, as the hot sugar will cook the almonds and you don’t want them to over-roast. As soon as you (gently) dump the almonds into the pan, start stirring the pan to ensure all the nuts are evenly coated and cook evenly. You will notice that once the water has completely evaporated, the sugar will become clearer and start making small bubbles. At this stage gently keep the sugar cooking to caramelize it and roast the almonds. If the almonds are really fresh, they may start to crackle and even pop as the naturally present water is cooked out of them. Don’t stir the pan to vigorously as you may trigger the re-crystalization process before the sugar has had a chance to caramelize! After about five minutes, you should be able to start smelling the caramel-ly roasted nuts, and you’ll also notice the sugar start bubbling more aggressively(as in the picture above). When the sugar starts to bubble like this, it is about to start re-crystallizing. Add in the quarter cup of vanilla sugar and keep stirring the pan. The sugar will turn back into a solid as it re-crystallizes and will become almost”sandy” in the pan. Keep stirring to properly mix in the vanilla sugar and make sure it is fully melted. Turn of the heat and then using a large spoon, quickly transfer the candied almonds to the parchment lined sheet pan. Be careful not to touch the nuts with your hands!! The sugar is hot and will instantly burn you! Use a spoon and spread the nuts out as well as you can to ensure they are not clumped together. Let the ‘Gebrannten Mandeln’ cool completely before using your hands to break the up if they are stuck together! Congratulations! 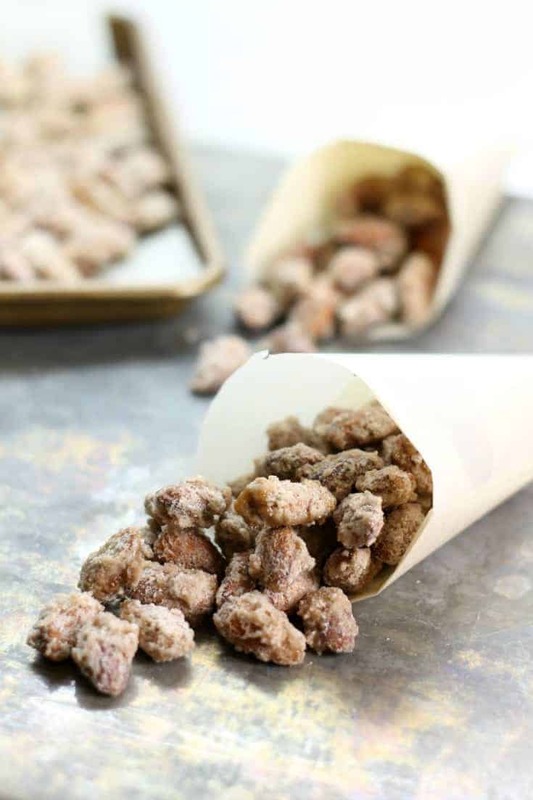 You have made your very own candied almonds at home! These should keep for a week or two if stored in an air-tight container. The candied nuts will not really go bad, but they may absorb moisture from the air, making the sugar go sticky and soften. Guaranteed they will not last that long though! 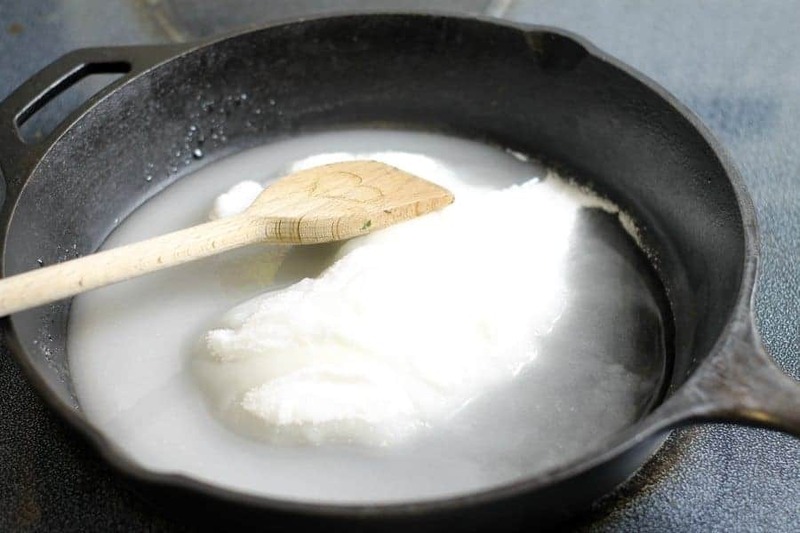 Melt the plain white sugar and water together in a pan, and bring to a boil over high heat. 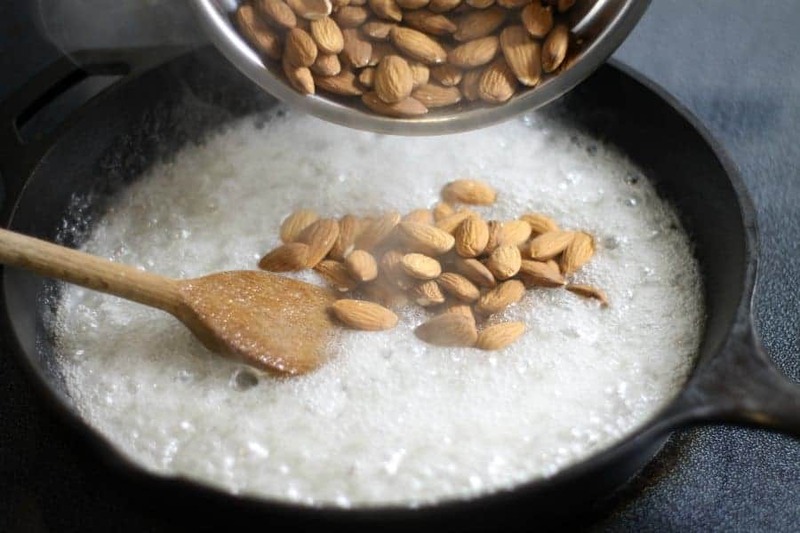 Once boiling, turn the heat down to medium and carefully add the raw almonds to the pan. Stir the almonds to ensure they are evenly coated and not clumped together. 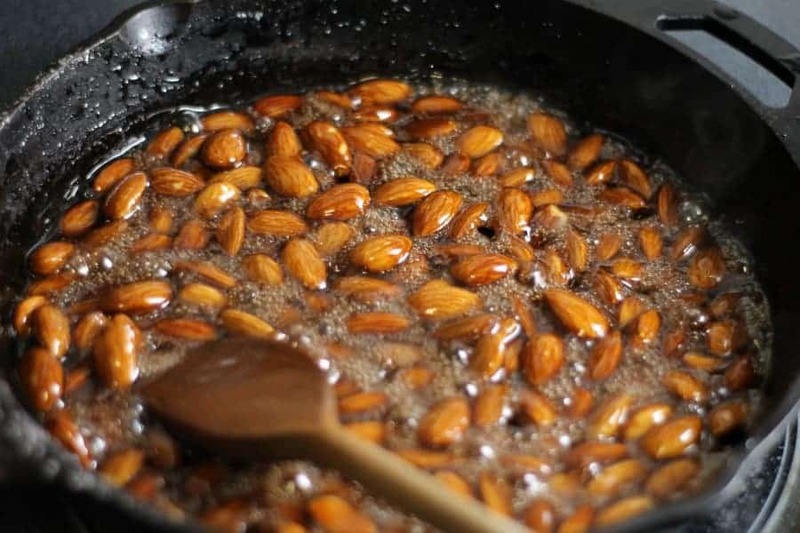 Cook the almonds in the sugar water until the water has completely evaporated and starts to caramelize. Gently keep stirring the nuts. Cook the almonds for about 5 minutes, the sugar will start to bubble more and more until it starts to re-crystallize and become "sandy". Add the 1/4 cup vanilla sugar to the pan and mix it in well making sure it all melts. Cook for another few moments, and then transfer the candied almonds to a parchment lined sheet pan to cool. Hot sugar can cause very severe burns. Never touch the hot nuts or sugar with your hands, and use a cast iron pan or heavy bottomed pot, to prevent the sugar from scorching. Christmas Food Advent Calendar | Spice It Up! I love these! The ones at the market are made with butter so I can never get them, it’s time to try making them at home. Great idea to make your own when you can’t find it anywhere else! These look really yummy! Yum! These look so tasty! I love the addition of vanilla sugar! And I think farmers/local markets are the best place to find authentic food when traveling. Thanks for sharing! I love candied nuts, and these almonds look perfect! Thanks for sharing. 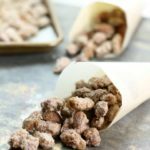 Candied almonds are my favourite and my husband loves them too. They are so easy to make and yours look yummy. Thanks for sharing.